SMITHFIELD - Steven H. Bartlett, 49. of Smithfield, passed away unexpectedly Thursday, Jan. 17, 2019. 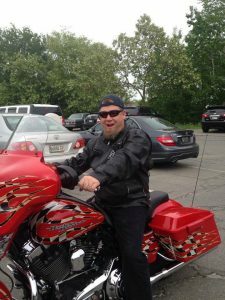 SMITHFIELD – Steven H. Bartlett, 49. of Smithfield, passed away unexpectedly Thursday, Jan. 17, 2019, in Waterville. He was born on Feb. 13, 1969, in Lewiston, the son of Norris C. Bartlett and Claire (Ward) Bartlett and step mother, Diane Bartlett of Rockland. Steven was a generous person not only with his time but also with his heart. He enjoyed the outdoors and spending quality time with his children. He attended Lewiston High School. He worked as a butcher at various markets. For the last 16 years he has been a stay at home dad which was the job that he enjoyed the most. Steven enjoyed hunting, fishing, motorcycle riding, UTV riding and spending time with his children, grandchildren and extended family and friends. Also he enjoyed his volunteer time and comradery with his peers at the Smithfield Volunteer Fire Department. He is survived by his wife and best friend of 17 years, Melissa (Fissette) Bartlett; his children Ashlee Bartlett-McCrillis of Auburn, Kourtney Bartlett-Plourde and her husband Justin Plourde of Auburn, Norris, Claire, Eddie and Eugene all of Smithfield; his grandchildren Saige and Chandler Bartlett-McCriliis and Jeramy – Owen Plourde all of Auburn. Also another grandson due in March; siblings, David Bartlett, George Bartlett and his wife Melanie of Sabattus, Dee Obuchon and her husband Shane of Warren, Marie Winslow Finnegan and her husband Don of Rockland, and Dane Winslow of Camden; father-in-law Eugene A. Fissette of Dracut, Mass. Also survived by several nieces, nephews, sister and brothers-in-law, and dear friends, including Robert Dyer of Lewiston. Viewing hours will be held on Thursday, Jan. 24, 2019, from 1 to 3 p.m. at the Smart & Edwards Funeral Home, 183 Madison Ave., Skowhegan, Maine, with a funeral service to follow at the funeral home at 3 p.m. A committal service will be held in the spring at the West Bowdoin Cemetery.